Foundation October 44 was established by statute in Putten on 28 October 1982.
the events on 1 and 2 October 1944. Our foundation has a pool of 784 (2016) registered sympathizers. During the raid on 1 and 2 October 1944 men, women and children had to report to the Germans in the market square near the Old Church. 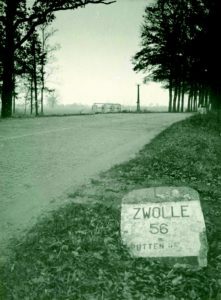 659 men were transported to Camp Amersfoort and then were subsequently deported to Concentration Camp Neuengamme. After arrival most of them were spread out to the various satellite camps of Neuengamme. Eventually 48 men returned from the camps. Within a year after their return 5 men as yet died as a result of the endured hardships. Meanwhile not a single survivor is alive anymore. So we have to deal with relatives from the first, second, third and even the fourth generation. 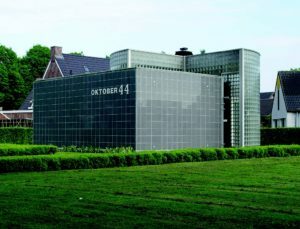 In 1992 the Memorial Hall in Putten was opened. Close to this is the monument The Woman of Putten in the so called Memorial Court. 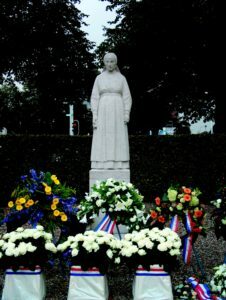 Every year on 2 October the victims are commemorated near the monument. Afterwards there is an informal meeting on behalf of the foundation. Annually around 2 October there is a special day for schools for group 8 of the elementary schools. By means of an educational programme the children are informed about of the Putten raid Putten. Regularly lectures are given and interviews taken. The annual meeting for sympathizers takes place in May. 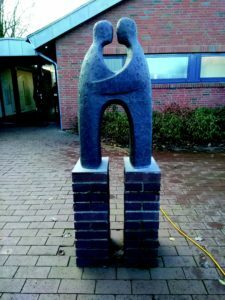 One of our activities in 2017 was giving assistance to the creation of the new exhibition in the memorial room of Ladelund, a satellite camp of Neuengamme, where 110 men of the raid deportees perished.